Both of our kids were able to start enjoying board games with us when they were 2-years-old. Generally speaking, 2-years-old is the time that kids can really start grasping those basics - taking turns, rolling dice, moving pieces. These are the skills that will set them up for a lifetime of fun family game nights - so finding the right games for the youngest gamers in the family is an important task. Playing games ignites our imagination, and they certainly teach us many useful skills like problem-solving and abstract thinking. But, most of all, they are fun - and they provide invaluable bonding time for the whole family. Right now our kids are 6 and 3. Many of the games we had when our son was 2 are the same games we’re enjoying again with our daughter now. And, now that’s she’s 3, we’re ready to put together our very first list in what will become a series of best board games by age - the best board games for 2-year-olds. This is a personal list based on our own experiences, and I hope it helps you find a great starting point for your own game night. If you have kids, you know there’s a huge difference between 24-months and 35-months-old. Kids grow and learn so fast that the term “2-years-old” actually covers quite a range of abilities. Most of these games require mastering the basic concept of taking turns - and then practicing something along the lines of colors or counting. But the rules and the gameplay are of course all very simple. This is the beginning of gaming, after all. Whether or not your kids are ready to play all of these games very much depends on where they are on the 2-year-old spectrum, and how ready they are to take turns and follow simple directions. The good news is that all of these games play very quickly, so attention span should definitely not be much of an issue. 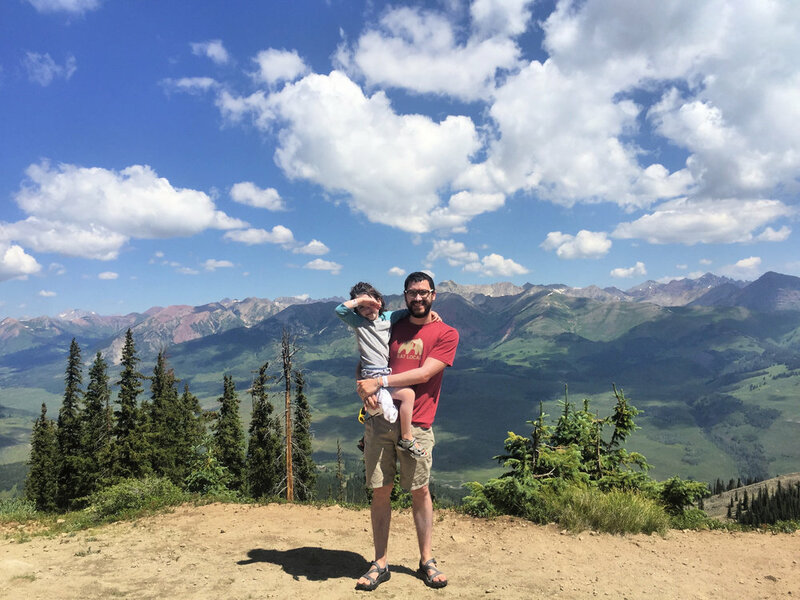 I hope this list helps you find a new game to share with your little ones. Let us know what you think, and make sure to tell us what games your kids love in the comments! Disclosure: This article includes affiliate links. Clicking on these links will lead you to view the items’ listings on Amazon.com. Any purchases made helps support Dad Suggests. We have quite a few memory games in our house - games where you flip cards over and try to find matches. Most of them are actually from my childhood (does anyone else in the world own Hamtaro memory?) And we found out pretty quickly that a simple game of memory is a really popular choice with the little ones. Perhaps the most popular memory game in our house is one called Shopping List. Our daughter received it for her birthday and she was so proud to have her own game. She punched out every single piece by herself while we weren’t looking and had the whole thing set out ready to play when she came to get us. “Ready go shopping?” she said. 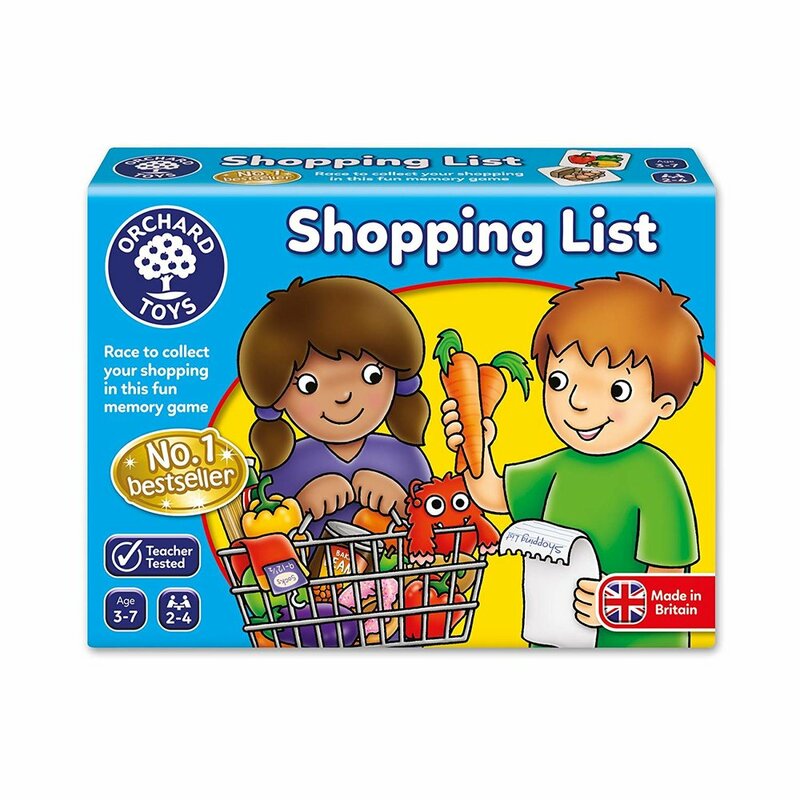 Everyone has their own shopping list that they are trying to fulfill and a shopping cart or basket to put their items in. The first person to find all of the groceries they’re looking for wins. Games like this obviously work on memory skills and the ability to pay attention - but they also secretly work on important basics like waiting your turn to try again. You can find Shopping List to purchase here. We got Hungry Hungry Hippos for Christmas when our daughter was 2 - and it was definitely one of the major hits of the day. Both of our kids were crazy about it. In order to play this classic game, all you have to do is press down on your plunger to make your hippo try to eat as many of the colorful balls rolling around as possible. We tend to not even count when we’re done or make a big deal about it. We just toss the balls back into the middle and go again. It’s funny and it’s chaotic and it brings back very fond memories. Sometimes we forget that the point of games is to have fun, and Hungry Hungry Hippos is definitely always a quick burst of fun for the kids. You can find Hungry Hungry Hippos to purchase here. Wig Out! is basically a matching game with cards full of a silly cast of characters. The first person to get rid of their hand wins. The recommended age on the box is 6+, but our daughter legitimately beat us many times before her third birthday. It was truly shocking, but it’s true. I think it’s very doable because the rules are so simple. So either we have some sort of Wig Out! prodigy on our hands, or it’s safe for us to say toddlers can definitely play this game too. Our daughter plays Wig Out! a little differently than the rest of us. She lays all of her cards in front of her instead of keeping them secret. She just looked for stacks she can add her cards to and she very often finishes first. She’s working on spatial awareness and focus and it’s very cute when she yells “wig out!” after every round. You can find Wig Out! to purchase here. Peaceable Kingdom is definitely one of our favorite publishers, but the vast majority of Peaceable Kingdom games we have and love are geared towards children ages 4+. 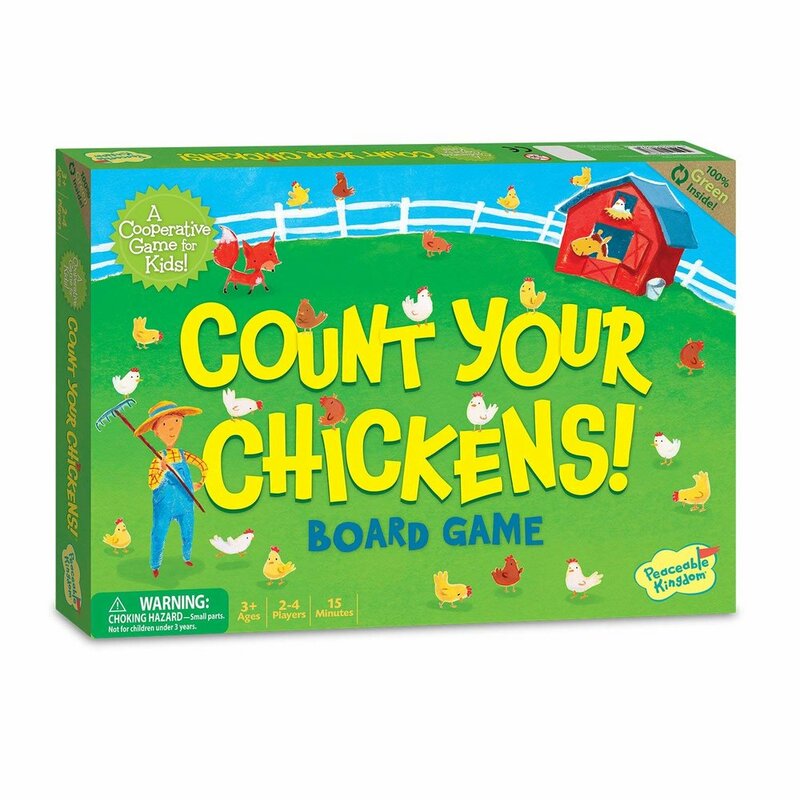 Count Your Chickens!, on the other hand, is definitely suitable for 2-year-olds and for introducing your kids to all of the basics of board games. It was one of the very first games we ever bought for our son, and now we’re enjoying it again with our daughter. In Count Your Chickens! you’re trying to collect all of the chickens and bring them to the coop with their mom before the fox gets them. On your turn you spin the wheel and it lands on an animal. You then move the mama chicken to the next square with that animal on it and count how many squares you moved. Everyone can count out loud together and then put that many baby chicks into the coop. Unfortunately, if you spin the fox too many times you aren’t going to be able to collect all of the chicks. Cooperative games are our favorite way to play and this is a great place to start. You can find Count Your Chickens! to purchase here. Don’t Be Greedy comes packed with some harsh lessons for kids - but it’s fantastic. You get a big bag of jewels and all you have to do on your turn is close your eyes and pull one out. If there’s a sad face on it you have to put it back into the bag, but if it’s a normal jewel you can keep it and put it in your treasure chest. Simple, right? But if you put a jewel in your treasure chest you also get a choice. You can risk everything you’ve gotten this turn and draw again. This time if you get a sad face you have to put back all of the jewels you got on this turn. It’s a great introduction to the consequences and rewards of pressing your luck. Every single time we play we ask our daughter - “are you going to stop or are you going to be greedy?” “Be greedy!” she says. But I’m happy to report that I think she’s finally learning her lesson. You can find Don’t Be Greedy to purchase here. I honestly have no idea why Candy Land catches so much grief these days. It does exactly what it intends to do - introduces toddlers to how games work. I have very fond memories of playing Candy Land at my grandmother’s house. It was one of the only games she had at her house and even though I was very little I vividly remember going to get it in her pantry. The art and the characters are definitely enough to get the imagination of a 2-year-old fired up. Who are these awesome people living in this crazy land of candy? 2-year-olds can definitely play along in Candy Land because it’s a simple matter of drawing a card and moving your character to the next square of that color. It’s not supposed to be rocket science people - so let’s lay off of the Candy Land bashing. Think back and perhaps you’ll recall how excited you were when you were little and you drew a character card instead of a color card and you got to skip giant chunks of the game board. Candy Land is a toddler tradition and that’s that. You can find Candy Land to purchase here. The games in HABA’s My Very First Games series are truly fantastic. With their experience in wooden children’s toys, HABA is definitely the leader in high-quality components in board games. I love the durability of these components - and just how much charm they add. The really cool thing is that the wooden pieces are such high quality they can be used for free play without playing the game. In Little Garden, Gardener Gabriel is trying to grow his garden before Molly Mole burrows up out of her molehill and presumably starts gobbling things up. If you can finish growing the strawberries, the carrots, and the tulips before Molly Mole finishes burrowing, then everybody wins. At the end of the day, I can’t stress enough how attractive the entire package is - and it shouldn’t be underestimated how much that can spark the imagination. You can find Little Garden to purchase here. 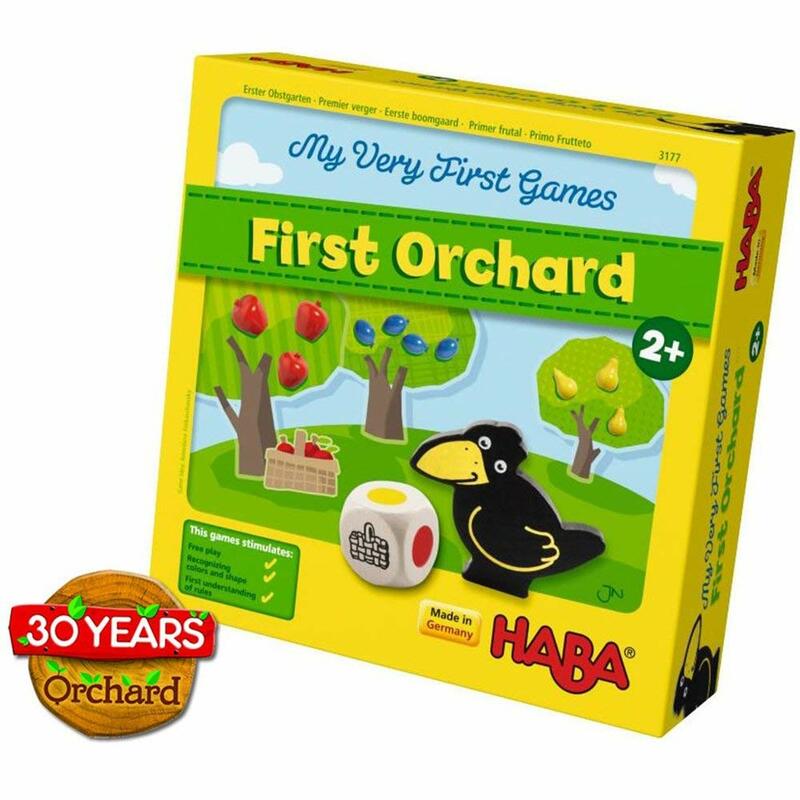 If a friend asked me what to buy as their child’s first board game, my answer would be First Orchard every time. HABA’s wooden components make this board game the perfect game for 2-year-olds. There aren’t any little pieces to lose or knock around - and these large wooden fruits are easy for little hands to grab. Just like Little Garden, the pieces in this game are also ideal for playing with simply as toys. The point of the game is to harvest all of the fruit before the raven makes it to the garden and eats it all up. If you roll red you should harvest a red apple, if you roll yellow you should harvest a lemon, and if you roll the raven he gets one step closer to the garden. Our little one often has an adorable reaction to winning - she feels bad that the raven didn’t get to eat. So she brings him into the garden to gobble up some fruit at the end anyway. I don’t think there’s a better or more attractive way to introduce your kids to the joy of a family game night. You can find First Orchard to purchase here. What was your child’s first board game? 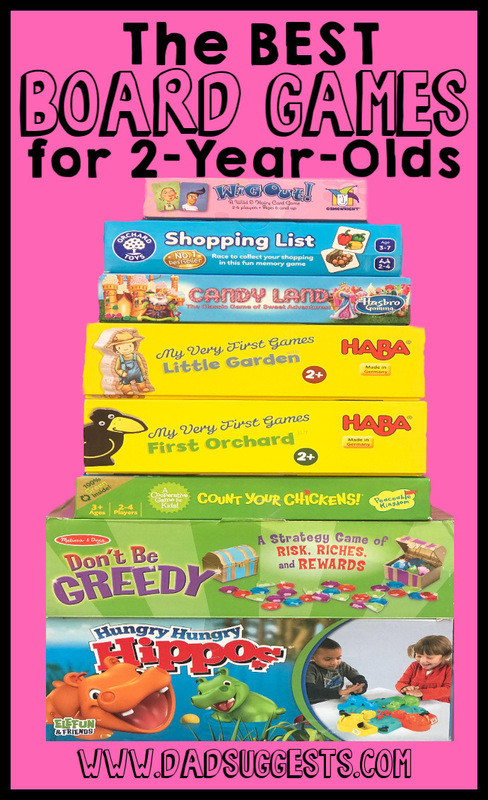 What’s your favorite board game for 2-year-olds? Did we miss yours? Let us know in the comments!